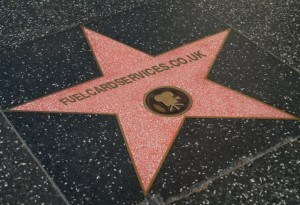 Does your fuel card supplier give you star treatment? Everyone loves a trier and hard work will always pay off in the end. Look at Leonardo DiCaprio… For years he was the runner up, the “also ran” the Silver Medallist, but finally this year, his starring role in the film The Revenant has secured him Hollywood’s highest accolade as Best Actor at the Academy Awards. But what about the other nominees, those people that put in the performance of their lives. Did they simply lose because Leo won? Well the answer is really no, because when they star in their next movie, their name will be preceded by “Oscar Nominated.” They were still recognised as being one of the top in their field and that’s really important. Let’s turn our attention to a Fuel Card Services sales office in Burnley in the heart of Lancashire. There’s approximately 60 sales staff there. Some are at the very top in terms of sales and regularly feature at the top of the leader board. That person has this month won the Oscar, but as important as that one individual is because they topped the charts, there are another 59 people in that office who work doggedly day in, day out to get the best possible outcome for themselves and our business. Our Burnley team, like all our offices around the UK work hard every day to win an Oscar by helping their valued customers cut their diesel and petrol bills. They consistently give their absolute best and never give up, they value their clients as without them they cannot succeed. Will they get to the top of the chart, perhaps, perhaps not? The one thing that they will always receive is the recognition they deserve for the great service they have given their customers. They get their version of the Oscar in Commission and Bonus. In a bottle of champagne, in a meal out paid for by the boss and also more importantly by those 2 words so often forgotten about, “Thank you!” from their customers. More importantly it’s our customers who really win! Find out how you can award yourself control of your diesel and petrol bills here. Adapted from an original blog post written by my colleague and friend – Mike Bratby.